(Phys.org) -- Researchers in Britain have found that migrating pink-footed geese have altered the path they take when returning to the UK to winter after flying southeast from Iceland, due to the construction of a wind farm. The study, conducted by Pawel Plonczkier and Ian Simms of Britain's Food and Environment Research Agency was held over a four year period using radar following the final construction of an offshore wind farm near Lincolnshire. They found, as they note in their paper published in the Journal of Applied Ecology, that as the finishing touches were applied to the wind generators, the geese began taking an alternate route when looking to overwinter in the UK. The findings offer some relief to ecological organizations who have feared that migrating geese and other birds would meet their death running into the giant blades used by wind generators if wind farms were erected in places where the birds were used to flying. This fear was compounded by the fact that geese find it difficult to change course in midflight and because they fly at night sometimes, making it more difficult of course, to see obstacles in their path. The researchers began their observations after the towers were built, but before the generators were added, back in 2007. They used radar to track the movements of approximately 40,000 geese as they migrated over a four year time frame. Initial results were difficult to gauge as Europe experienced some unusual weather patterns. Overall however, a pattern emerged as it became clear the birds were intentionally avoiding the wind farm, clearly understanding the danger it represented. The results don’t erase the fear of bird deaths from wind farms, of course, as the team studied just one species reacting to two nearly adjoining facilities, though it’s hard to argue with their results. In all they noted that the proportion of geese flying outside the wind farm zone during their observations rose from 52% to 81% and the majority of the geese that continued to fly through the zone altered their altitude to fly higher than the blades could reach. While this news is promising, more research will have to be conducted before ecologists gain a true understanding of just how much danger wind farms pose to migrating birds. 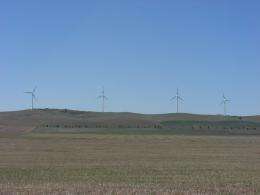 The findings offer some relief to ecological organizations who have feared that migrating geese and other birds would meet their death running into the giant blades used by wind generators if wind farms were erected in places where the birds were used to flying. Incredible, isn't it? Animals that fly all their lives know to avoid new obstructions in their path.